Just 1,650 feet from the beach, Neriides is a complex of villas located on a hillside in Hersonissos Bay. It features self-catered accommodations with a private pool and a balcony with landscape and sea views. The 2-story villa offers a private entrance and air conditioning. The ground floor includes a satellite TV, DVD/CD player, seating area with fireplace, fully equipped kitchen, dining area and bathroom. The upper level consists of 3 bedrooms and bathroom with spa bath. Free barbecue facilities are on the premises of each unit. Relax in the garden or lie back on the sunbeds on the sun terrace that surrounds the swimming pool. 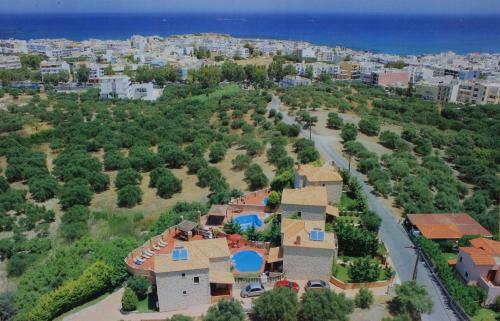 Neriides Villas is 3.1 mi from the city of Heraklion and 14 mi from Heraklion Airport. It is 3.1 mi from the Crete Golf course. There is a bus stop 1,000 feet from the property. When would you like to stay at Neriides Villas? This villa features a balcony, dishwasher and spa bath. House Rules Neriides Villas takes special requests – add in the next step! Neriides Villas accepts these cards and reserves the right to temporarily hold an amount prior to arrival. Please inform Neriides Villas of your expected arrival time in advance. You can use the Special Requests box when booking, or contact the property directly using the contact details in your confirmation.